What I Wore with my Slicked-Back Hair. 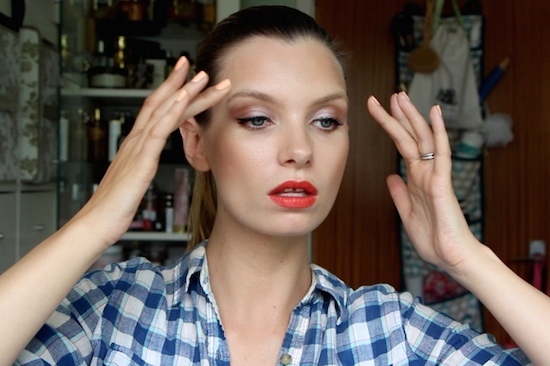 A still image from my latest video (a lovely one, it’s about styling greasy hair!) and the light is hitting my eyelids in just the right way to show off the colours from the Laura Mercier shadow quad that I wrote about yesterday. How lovely is the pearly pink? It’s probably not the best match with the bright orangey-red matte lipstick (post here) but I was having one of those days where you just chuck everything on and see if it works. The foundation is Dior Airflash and the mascara, post to follow, is Estee Lauder’s Sumptuous Infinite Daring Length. You can get more detail on that here, or wait for my post with before-and-after pics. The hairstyle I’m sporting here is a slicked-back ponytail, perfect if your roots are so oily there’s little else to do other than just go with the flow.. Please don’t think I make a habit of having greasy hair – I had cultivated it especially for this video! Previous Post Summer Shadows and a Must-Have Brush Set.